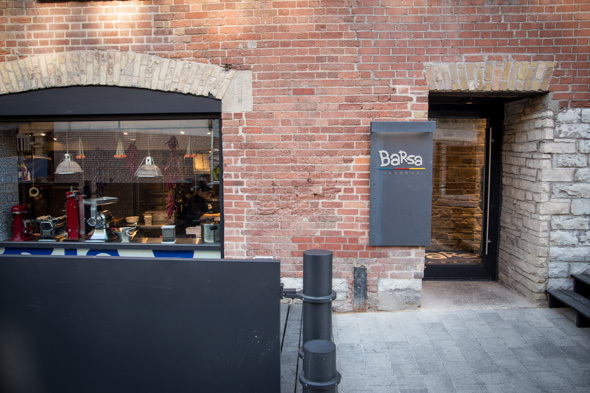 Barsa Taberna sits at the north tip of Market Street's restaurant row that now runs down the west side of the old St. Lawrence Market building. The 85-seat restaurant inhabits a historic building filled with original stone archways and 19th-century beams, with decor that contrasts old world elements with curvaceous bespoke furnishings, 30 foot artworks backlit with LEDs, and rich mosaic patterns. 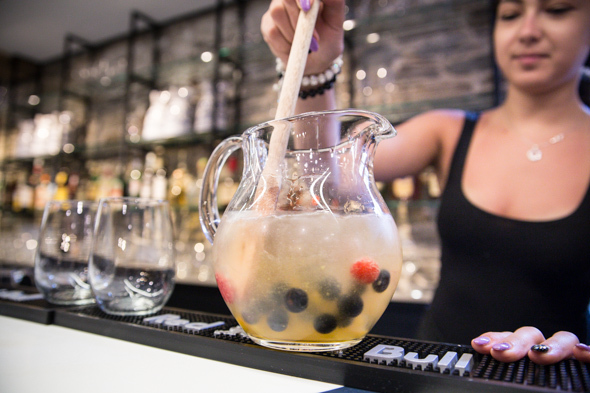 Patio seating out front will offer room for 75 and its major draw is pitchers of Sangria ($19-$20/half, $33-38/full) in red, white and sparkling Cava variations. Expect to see Estrella Damm, the beer of Barcelona, on tap in the coming weeks. 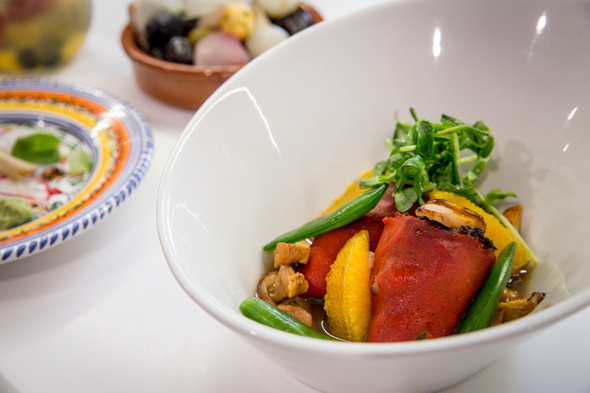 The tapas-based menu is divided into hot, cold and fried selections, and while many dishes are recognizably Spanish by influence, there are obvious twists and infusions of global flavours. Stuffed piquillo peppers ($13), for instance, are packed with dashi-braised short rib and served with chanterelles and collard greens. 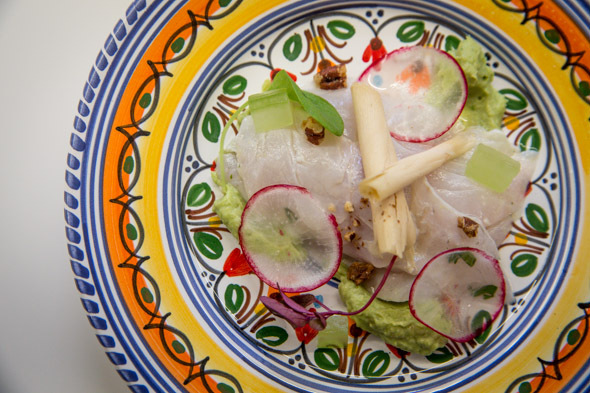 Sea Bream Ceviche ($10) takes on Peruvian flavours thanks to a tiger's milk, chili, and Amarillo paste marinade. Set over avocado mousse and topped with shavings of frozen foie gras, it's a delicate cold dish that plays creamy rich textures against the brightness of the fresh fish. 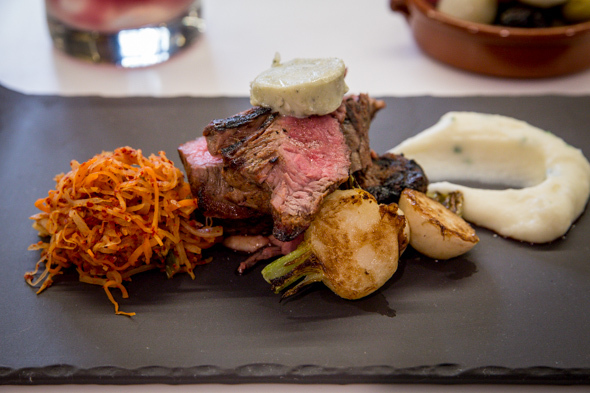 Banderillas ($9), named for a bull fighter's sword, is little pot of mixed pickles meant to be skewered. Quail eggs and harissa-marinated goat cheese balls join the cast of salty pickled snacks to add pops of creaminess alongside the acidity. 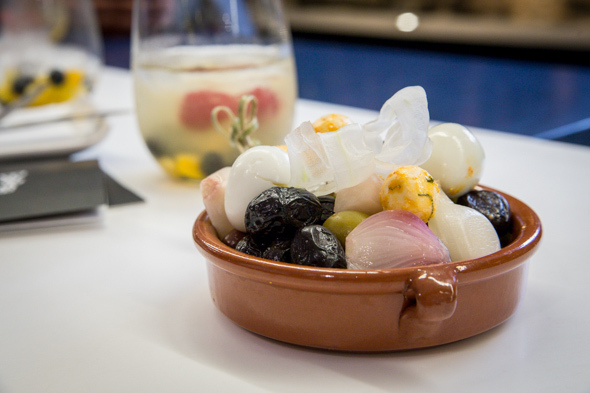 While a la carte small plates are generally priced between $9 and $13, there's the option to do a tapas tasting featuring a chef's selection -- six plates at a time for $50 or by the dozen for $100. Better still, order the whole shebang ($240) and try one of everything under the tapas menu (currently 18 plates) plus 3 larger plates. To share or to hoard as an entree, there are large plates like lobster linguine ($18), chorizo tasting platters ($18) and a striploin steak ($32) over buttermilk mashed potatoes with a knob of blue cheese butter and side of shredded kimchi. 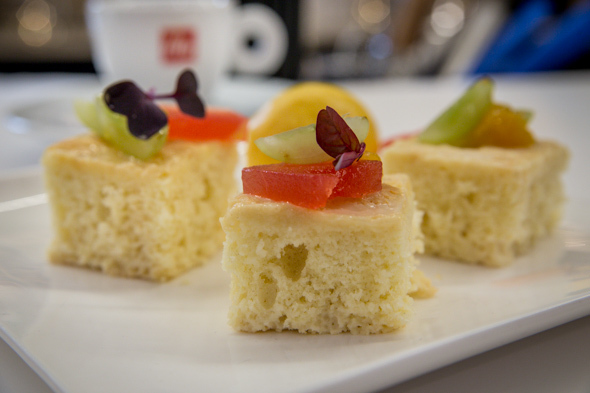 For dessert, a sangria cake ($9) decorated with coconut tres leche, compressed watermelon and grapes, is served with a mango sherbet. 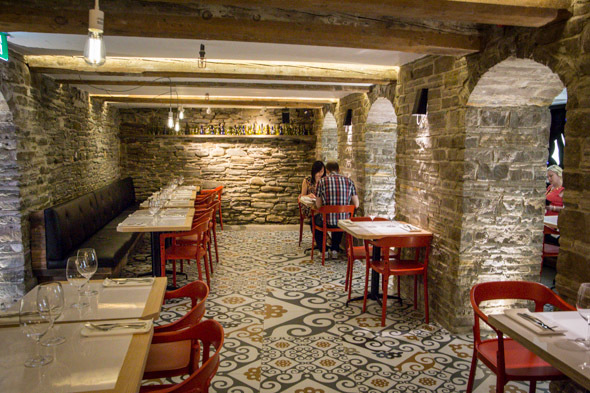 Barsa Taberna opens for lunch daily at 11am. A weekend brunch is set to launch in the coming weeks.